This foot was apparently added, rather than lost, in the translation. In fact, the Chinese characters on the sign in question, found by someone while hiking in China and posted at engrish.com, don’t say anything directly about feet. Part of the problem is that which is universal to all signs. Wording on signs is abbreviated. Be careful, you don’t want to lose your footing. Beware of the missing (or lost) foot. Beware of the missing foot. My crocodile leather purse is missing! Part of the translation problem on the sign that started all of this is probably the nuanced difference between saying “be aware” and “beware.” To “be aware” simply means to pay attention, but it could be for anything from listening to what your mother says to paying attention while driving a car. To “beware” in English definitely implies danger is likely in a more extreme sense. It is the difference between one letter and one space. 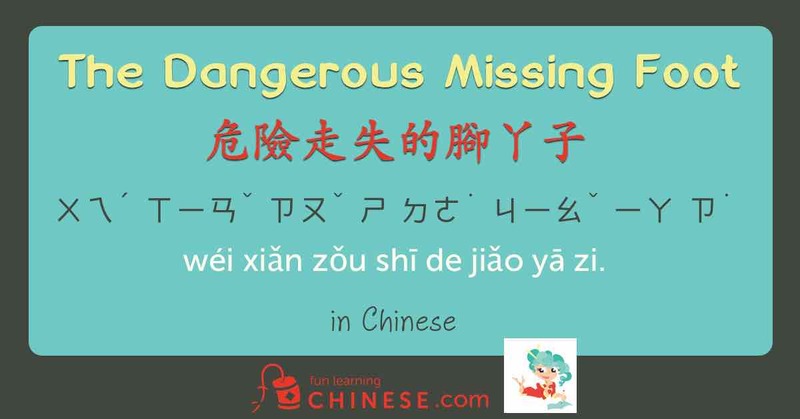 Another issue is the difference between putting the “-ing” suffix on “foot” instead of “miss.” To miss one’s footing is not same as to be missing one’s foot. It is unusual to put the “-ing” on the noun instead of the verb, but in this case it is what needs to be done. We had fun practicing sentences using 注意 ㄓㄨˋ ㄧˋ (zhù yì). It is apparently a phrase parents and teachers use a lot. Be alert! Be careful of falling rock! Or you can just use the common way to say be careful. Getting back to the original sign, you can see that nothing is mentioned at all about feet in the Chinese. As usual, the wording in Chinese is also chosen for balance in visual presentation, which may have been part of the problem with trying to translate it. The translator seems to have had some exposure to the turn of phrase in English of “losing one’s footing,” but without an adequate understanding of the different connotation of “missing one’s foot.” Trying to keep the words limited (and appealing the Chinese sense of visual balance) in English, plus adding the confusion of the concept of “losing footing,” appears to have NOT given the desired message in English. There is no nefarious Missing Foot marauding passersby. ❶ This combination of characters can be used as either a noun or adjective, but if as an adjective, the classic 的 (de.) is attached.